Want to grab a bite while chilling in Galleria? Check out Kwaliti, a hole-in-the-wall takeaway joint that offers some of the best rolls this side of town. 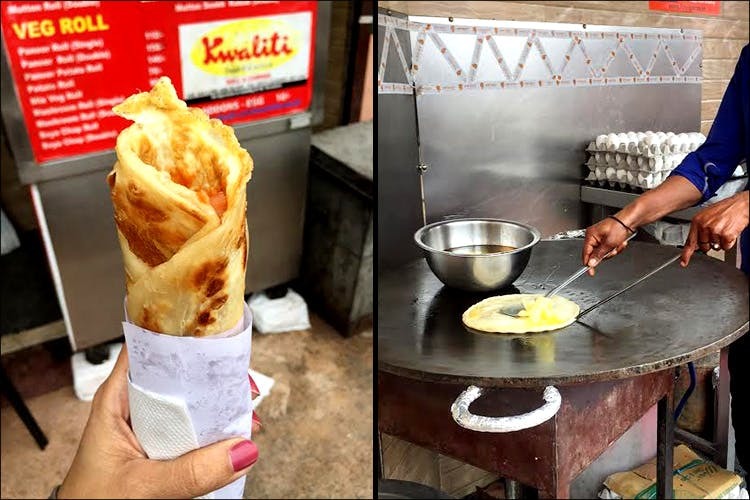 The king of Indian street food has to be rolls, and if you’re looking for that quintessential old-school Indian egg roll, Kwaliti is what you need. Go for the Single Chicken Egg Roll- flaky, layered maida paratha, crispy on the outside, stuffed with spicy meat on the inside. The dance of sweet-ish flaky bread and spicy chicken will leave you wanting more. Want it to be your dinner? We recommend the Double Mutton Egg Roll. Kwaliti has quite a few options for vegetarians too: potato rolls, mushroom rolls, paneer rolls and also soya chaap rolls for those who would like their rolls to be meatier, minus the meat.